If you’ve never used any of these methods before there are a few prerequisites before you get started. Both modules are far simpler to get started with than the API. Once you have the PowerShell Gallery installed, it’s as simple as an Install-Module command. That’s all the prerequisites we need to run the Azure AD commands. These additional steps are only required to use the Power BI API. I’ll also break these down into 2 methods of authenticating with Power BI. The first is interactive & prompts for credentials while the second performs an unattended authentication using stored credentials. For the interactive method you will need to reference the ADAL Assemblies. Having worked with the Power BI API in C# I’ve found these assemblies can be stored in different locations depending on how they are installed. For these examples, I’ll refer to where the PowerShell module installs them. Here’s the code excerpt for referencing the assemblies. This will be part of the final scripts detailed later though. You will also need to setup a Power BI or Azure App. This application is what controls what we can do with the API and we reference it when connecting to Power BI. Go to register a new app or from the Azure Portal. Adam Saxton has produced great documentation on this process. App Type is an important option where our choice differs depending on whether we’re using the interactive or unattended authentication methods. Unattended – Choose Server-side Web App. This will generate a ClientID & Client Secret. As this method is intended for app use you will see an option for both a Redirect URL and a Home Page URL. You can set these to anything as we won’t need them as part of our connection. $file = $folder + "user_cred.txt"
Interactive authentication Assuming you have your App set up & have a ClientID let’s take a look at getting some information out the Power BI API. Starting simple, we want to see all Workspaces (that my user has access to), all of their datasets & the last refresh information for each dataset. Once you’ve authenticated you will see the API calls in the output window followed by the data you requested. Log in to Microsoft Azure as an administrator. In the Microsoft Azure portal, click Azure Active Directory. Under Manage, click Properties. The tenant ID is shown in the Directory ID box. This script also uses the encrypted password file I mention earlier but requires an additional step to return the password to clear text which is then passed to the API. This isn’t an ideal method from a security standpoint but as the encrypted file can only be decrypted by the person who created it, anyone else running the script would not see the clear text password or be able to authenticate anyway. # Connection to Power BI REST API. # - Log in to Microsoft Azure as an administrator. #NOTE: First use of an "App" needs to be granted permission like in the interactive login method!! You can, however; also grant permissions from the Azure Portal if you have no way to interactively login with this app. 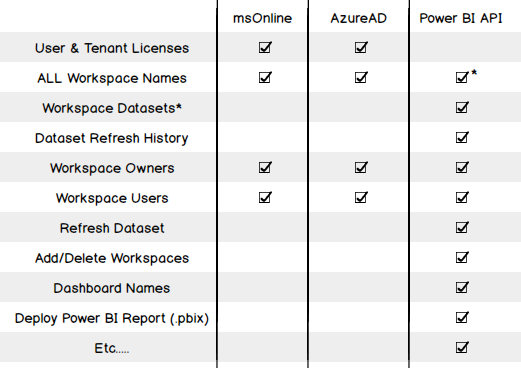 Go to Azure Active Directory -> App Registrations -> find your app -> Required Permissions -> Grant Permissions. Here are some other examples of API calls. You will find a list of all its capabilities in the API Reference with some example calls & C# code too. I hope these excerpts help you get started with connecting to & querying Power BI. I hope to expand on these scripts & actually present & analyze the data in a future post. Please comment below or come find me on Twitter or my blog if you have any scripts I’ve not covered here or a better authentication method.